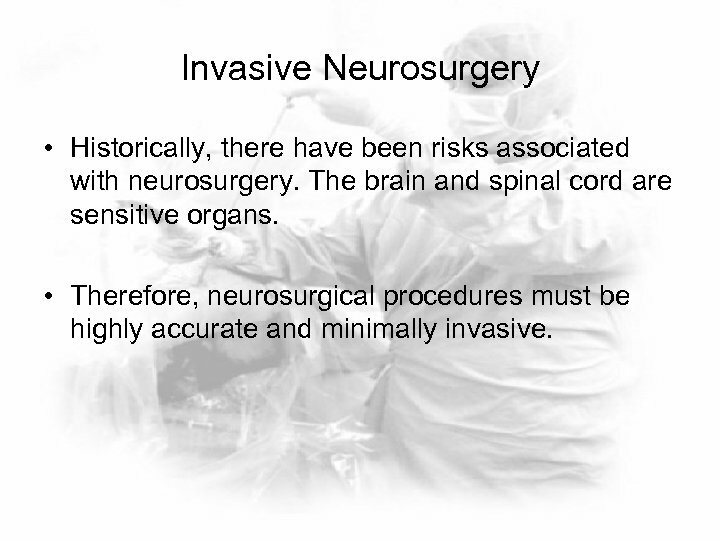 Invasive Neurosurgery • Historically, there have been risks associated with neurosurgery. The brain and spinal cord are sensitive organs. 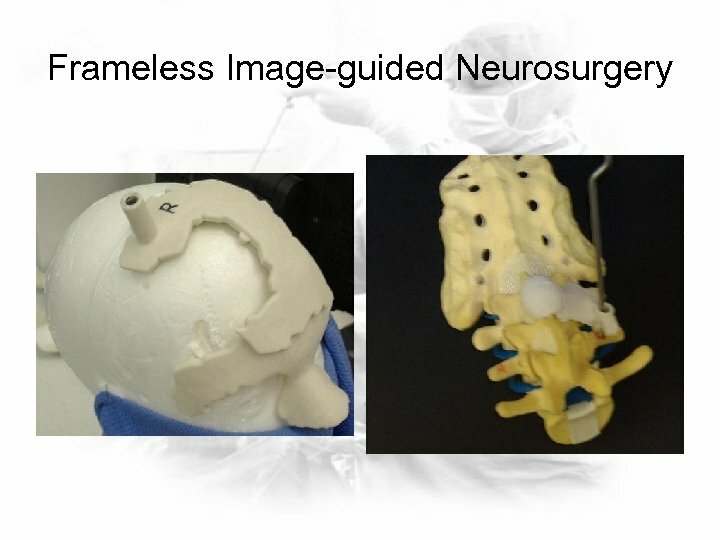 • Therefore, neurosurgical procedures must be highly accurate and minimally invasive. 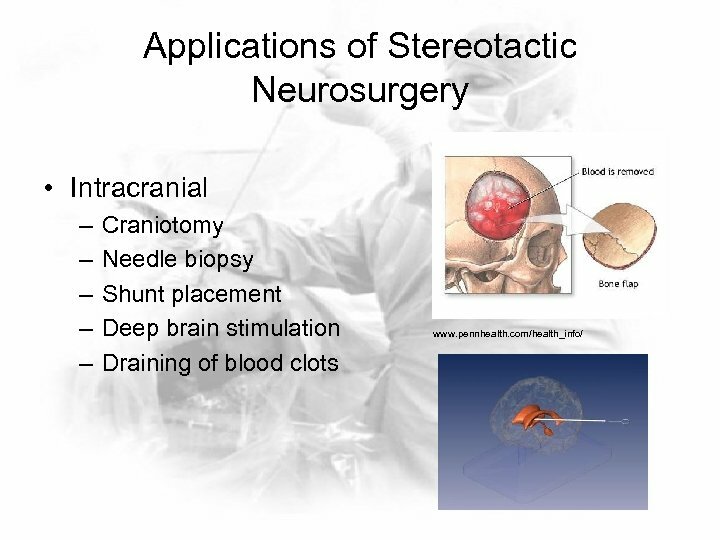 Stereotactic Neurosurgery • Use of external device to direct surgical instruments to a specific target in the brain. 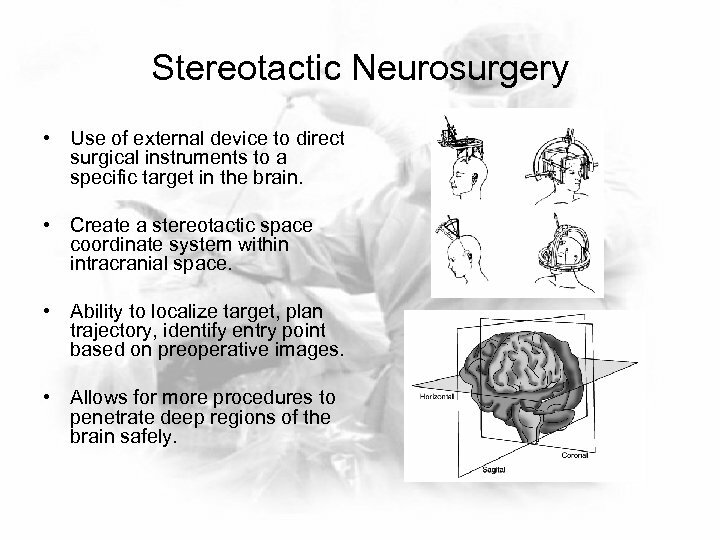 • Create a stereotactic space coordinate system within intracranial space. 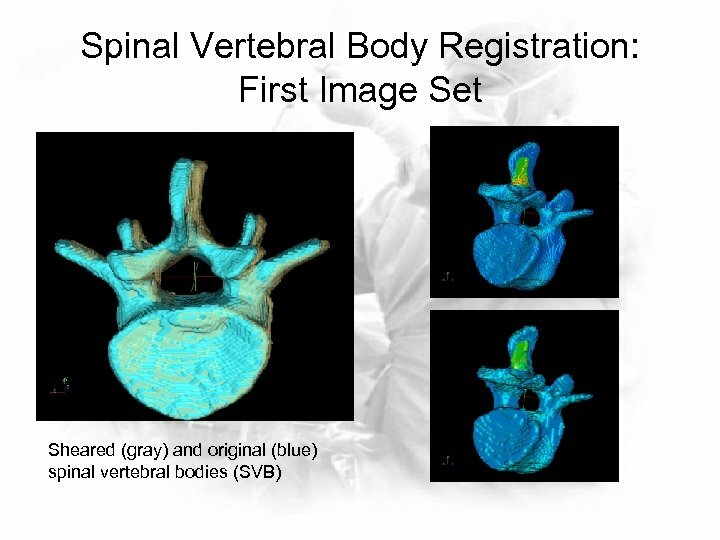 • Ability to localize target, plan trajectory, identify entry point based on preoperative images. 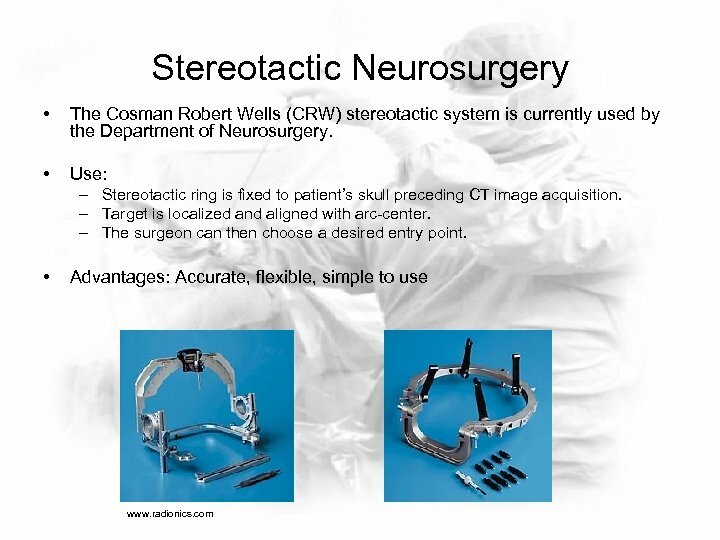 • Allows for more procedures to penetrate deep regions of the brain safely. 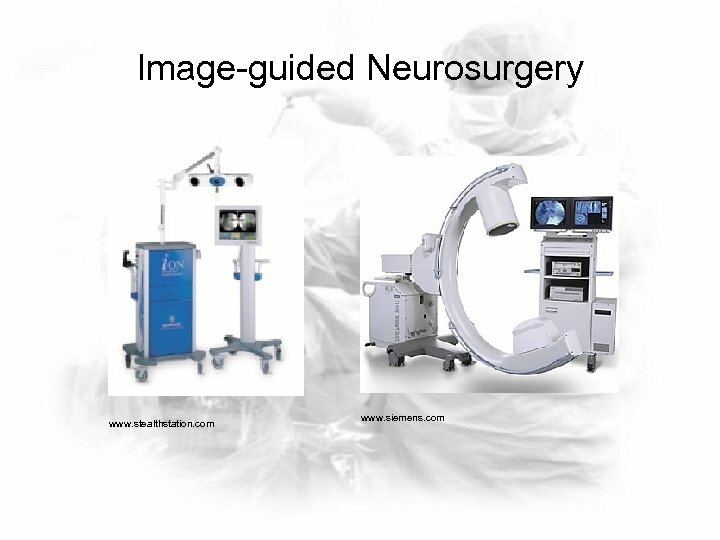 Image-guided Neurosurgery • Image-guided neurosurgery integrates preoperative imaging with the physical space of the patient in the operating room (OR) obtained from 3 D fluoroscopy. • Stealth. 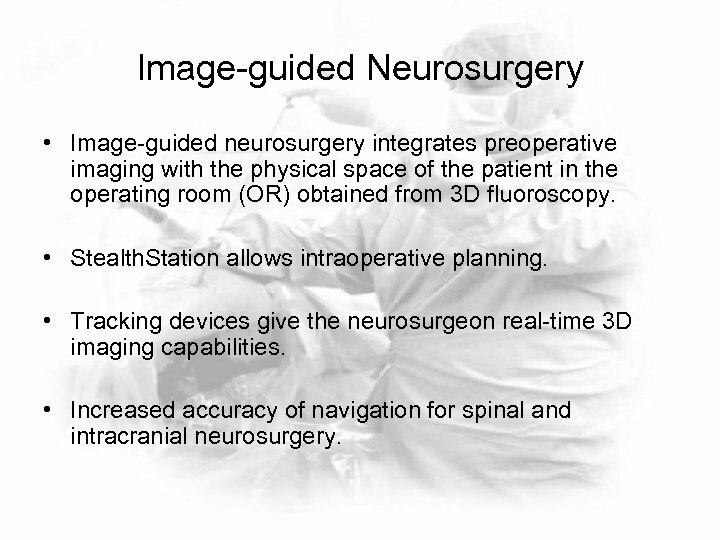 Station allows intraoperative planning. 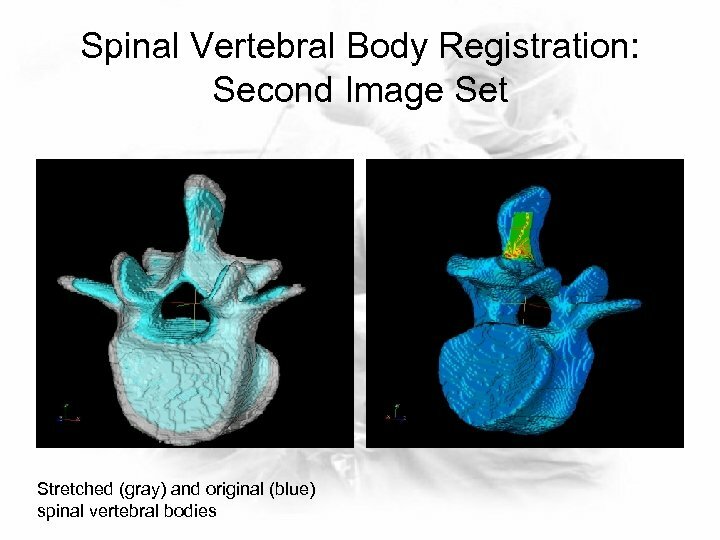 • Tracking devices give the neurosurgeon real-time 3 D imaging capabilities. 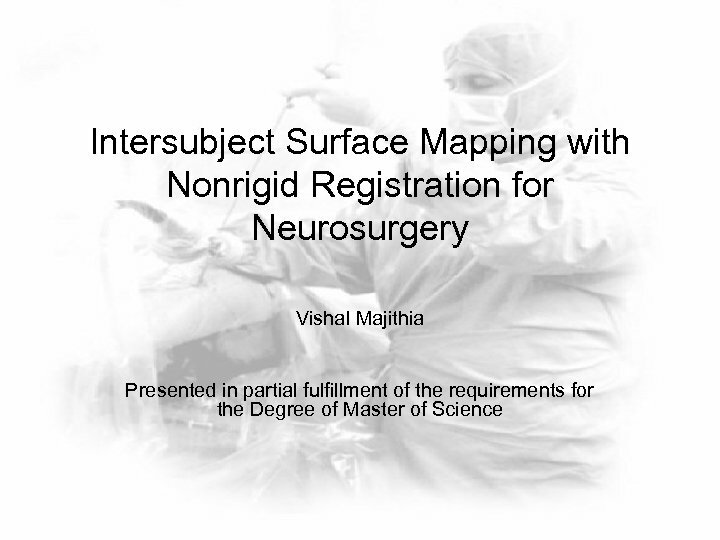 • Increased accuracy of navigation for spinal and intracranial neurosurgery. 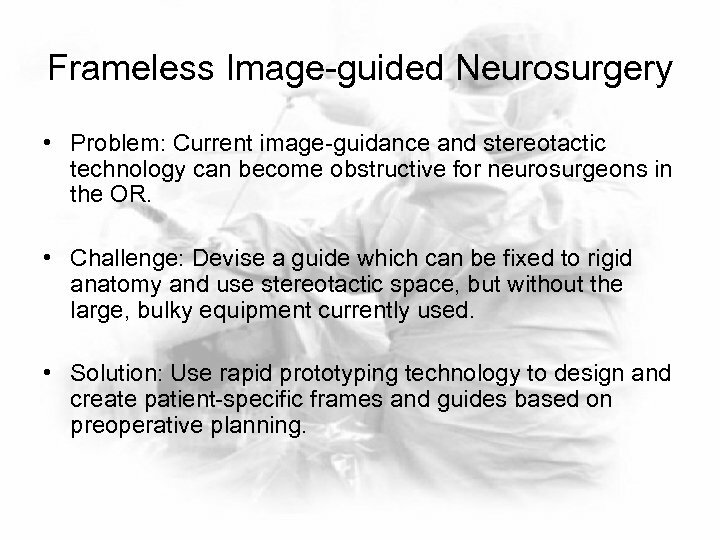 Frameless Image-guided Neurosurgery • Problem: Current image-guidance and stereotactic technology can become obstructive for neurosurgeons in the OR. 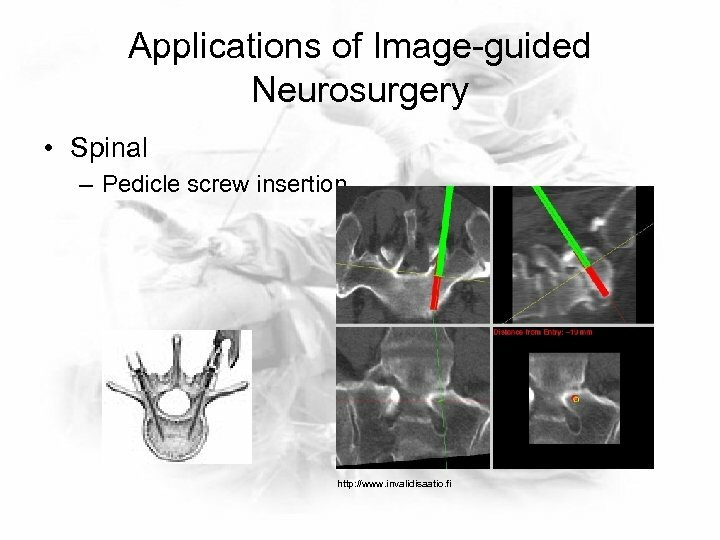 • Challenge: Devise a guide which can be fixed to rigid anatomy and use stereotactic space, but without the large, bulky equipment currently used. 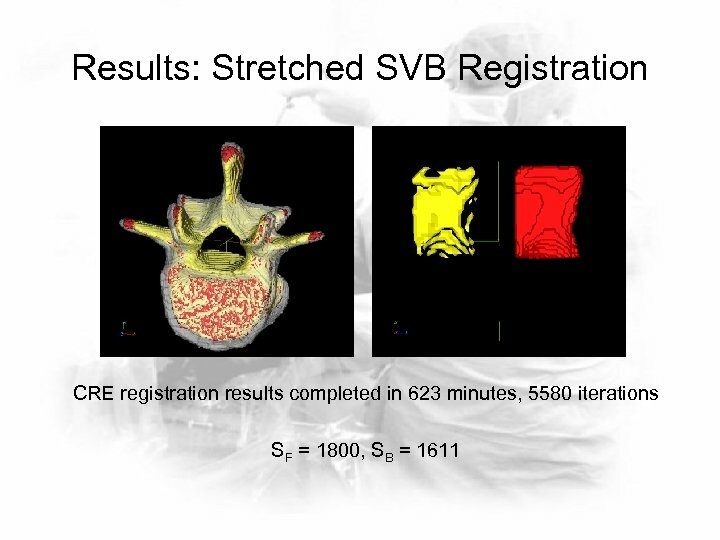 • Solution: Use rapid prototyping technology to design and create patient-specific frames and guides based on preoperative planning. 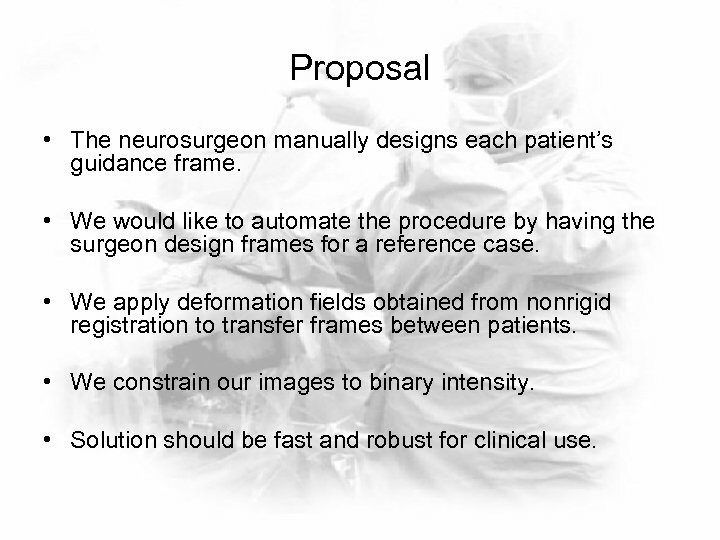 Proposal • The neurosurgeon manually designs each patient’s guidance frame. 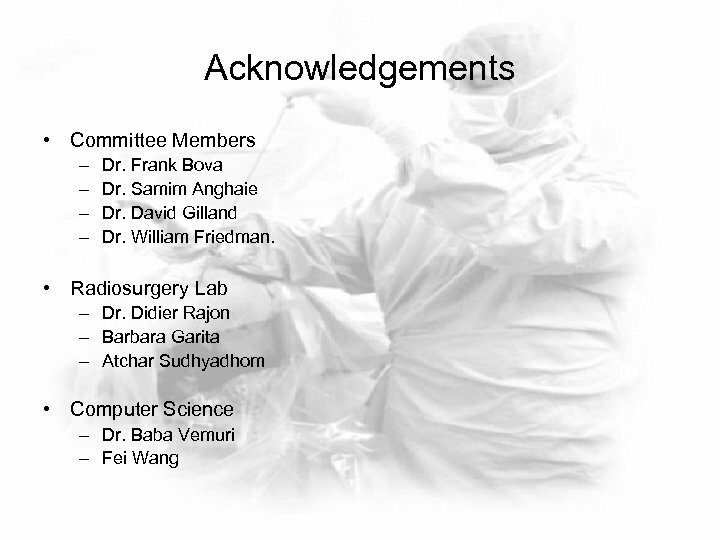 • We would like to automate the procedure by having the surgeon design frames for a reference case. 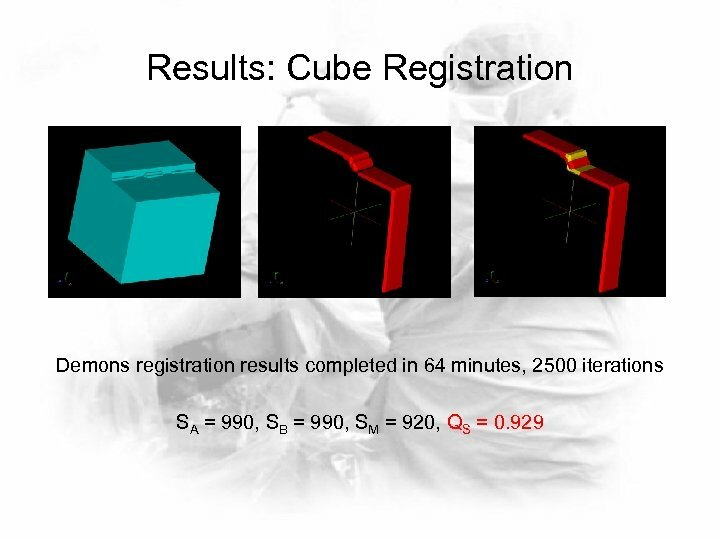 • We apply deformation fields obtained from nonrigid registration to transfer frames between patients. • We constrain our images to binary intensity. 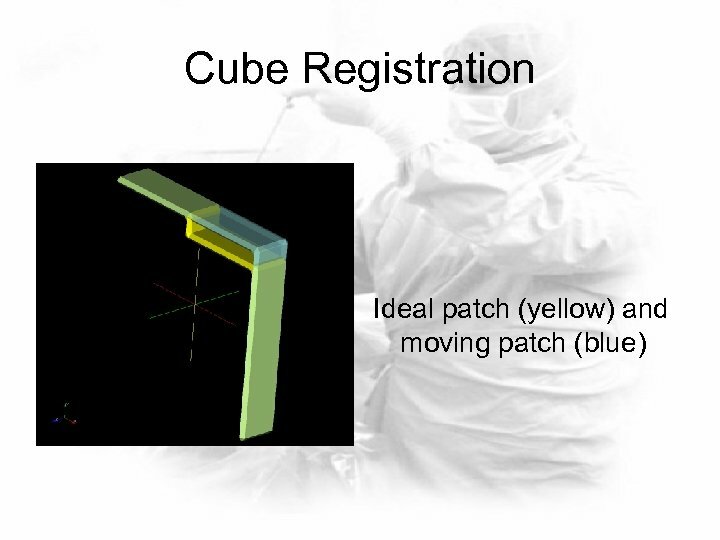 • Solution should be fast and robust for clinical use. 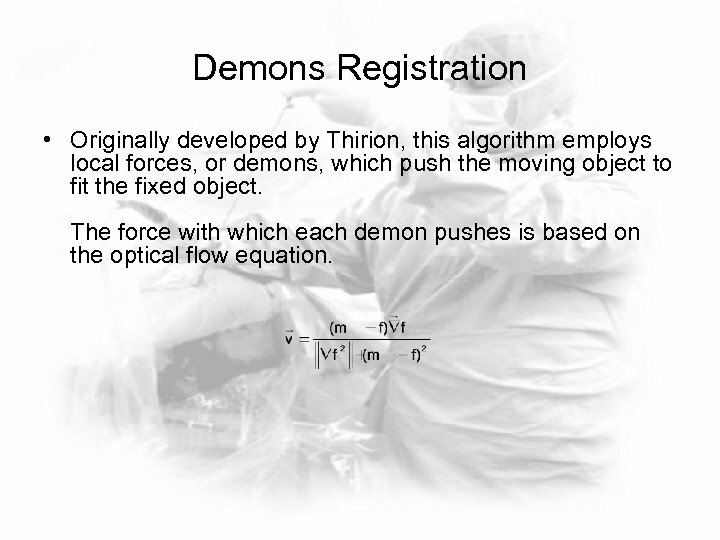 Demons Registration • Originally developed by Thirion, this algorithm employs local forces, or demons, which push the moving object to fit the fixed object. 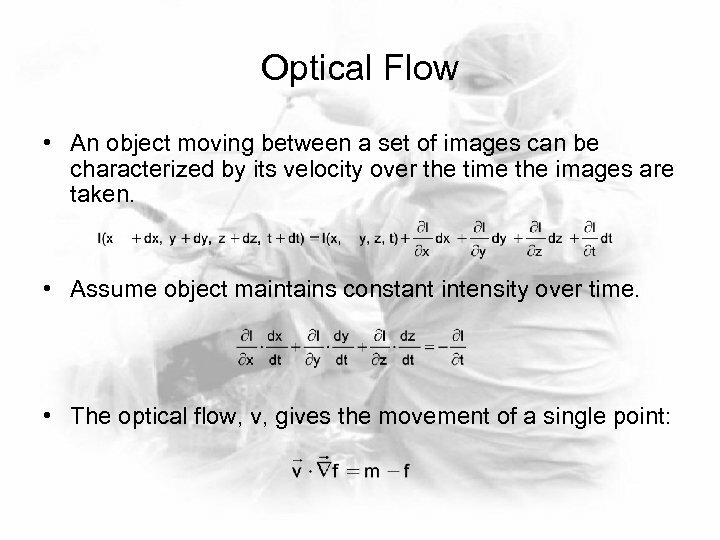 The force with which each demon pushes is based on the optical flow equation. 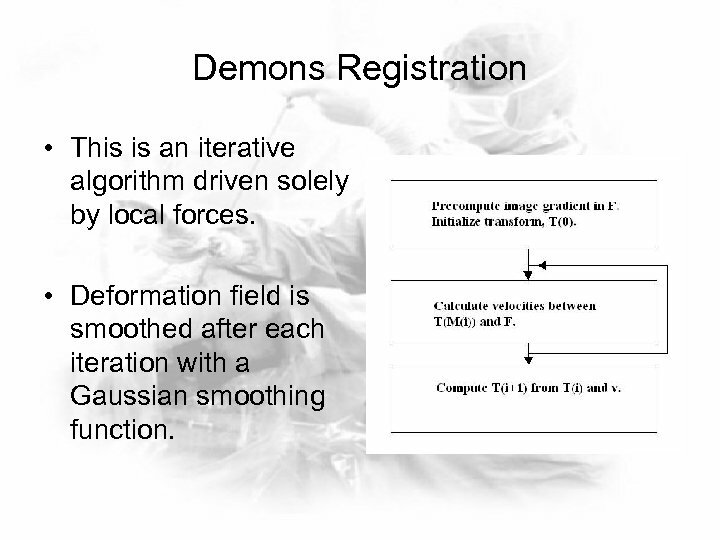 Demons Registration • This is an iterative algorithm driven solely by local forces. • Deformation field is smoothed after each iteration with a Gaussian smoothing function. 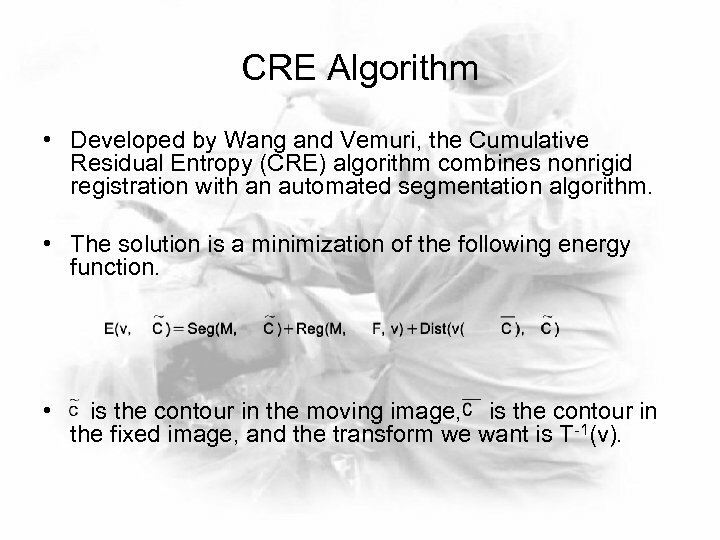 CRE Algorithm • Developed by Wang and Vemuri, the Cumulative Residual Entropy (CRE) algorithm combines nonrigid registration with an automated segmentation algorithm. • The solution is a minimization of the following energy function. • is the contour in the moving image, is the contour in the fixed image, and the transform we want is T-1(v). 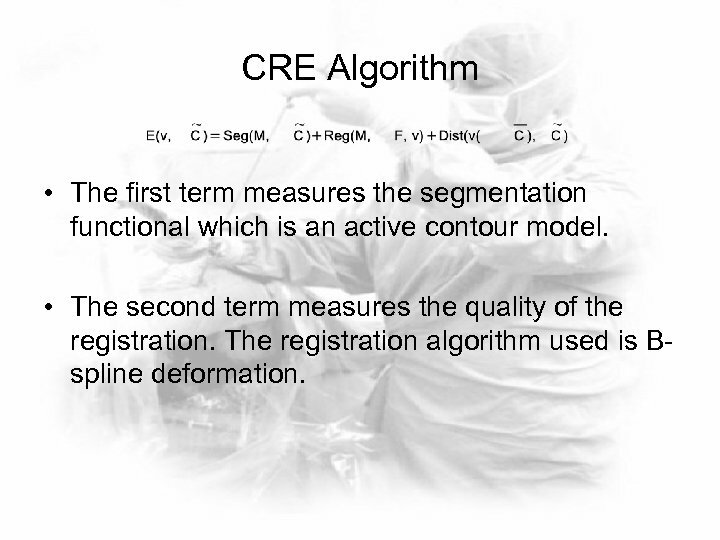 CRE Algorithm • The first term measures the segmentation functional which is an active contour model. • The second term measures the quality of the registration. The registration algorithm used is Bspline deformation. 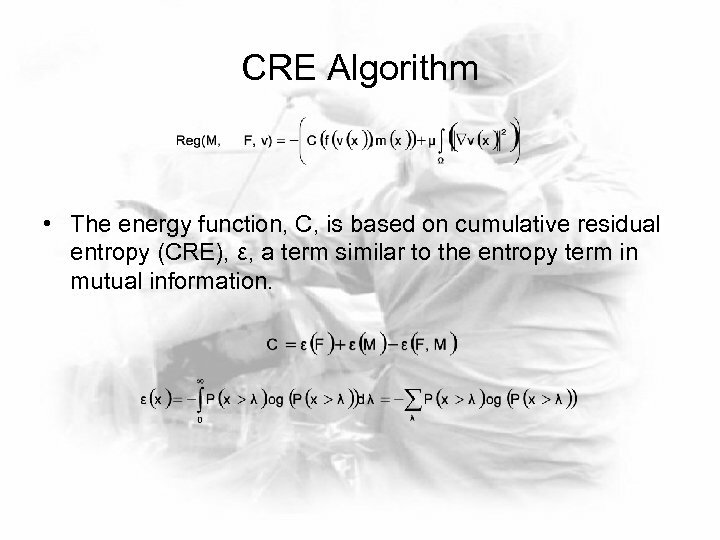 CRE Algorithm • The energy function, C, is based on cumulative residual entropy (CRE), ε, a term similar to the entropy term in mutual information. 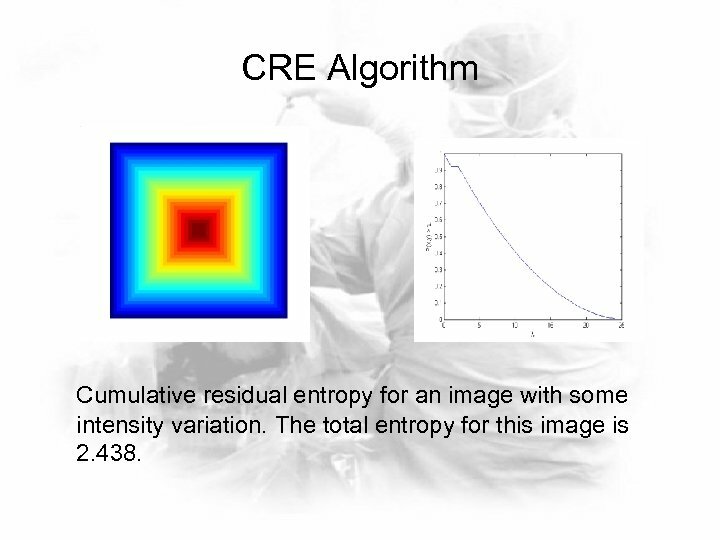 CRE Algorithm Cumulative residual entropy for an image with some intensity variation. The total entropy for this image is 2. 438. 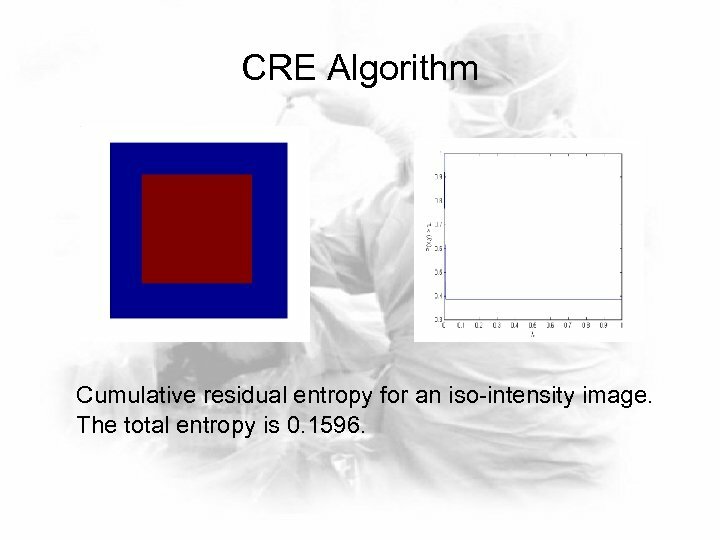 CRE Algorithm Cumulative residual entropy for an iso-intensity image. The total entropy is 0. 1596. 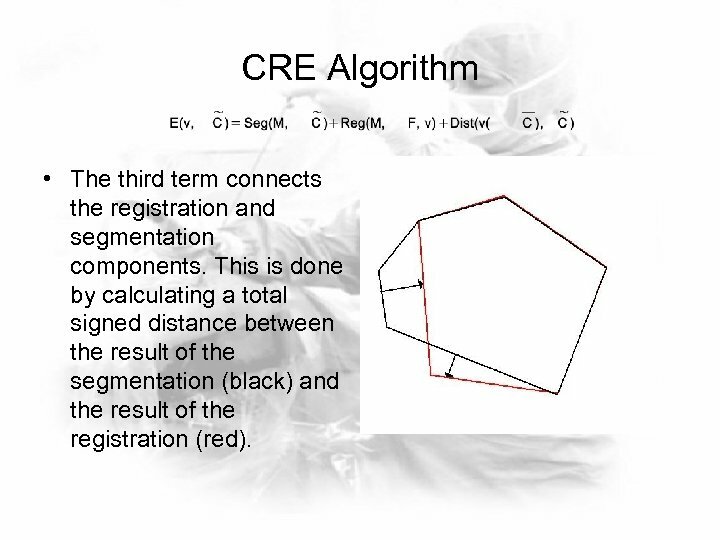 CRE Algorithm • The third term connects the registration and segmentation components. 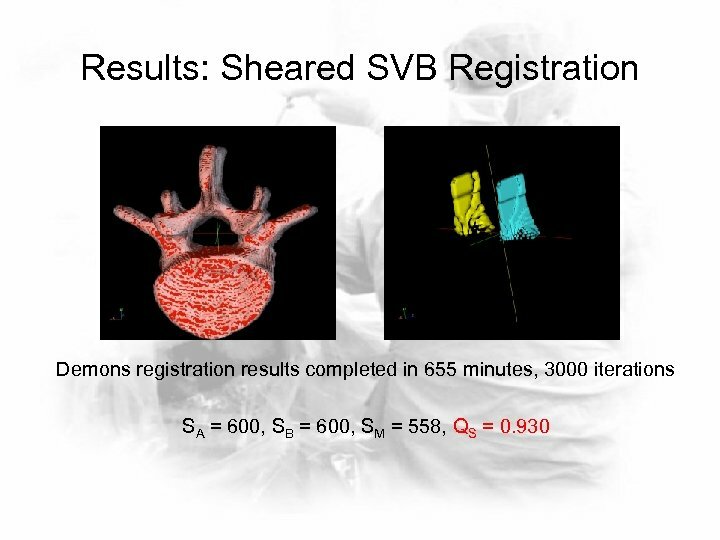 This is done by calculating a total signed distance between the result of the segmentation (black) and the result of the registration (red). 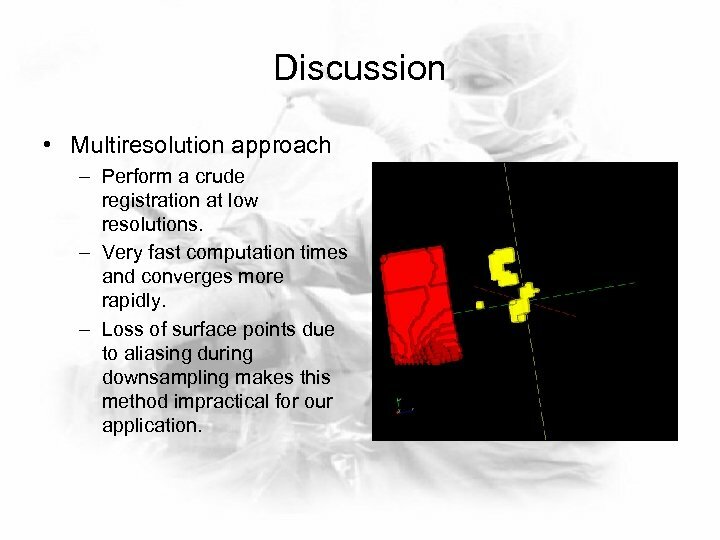 Discussion • Multiresolution approach – Perform a crude registration at low resolutions. – Very fast computation times and converges more rapidly. – Loss of surface points due to aliasing during downsampling makes this method impractical for our application. 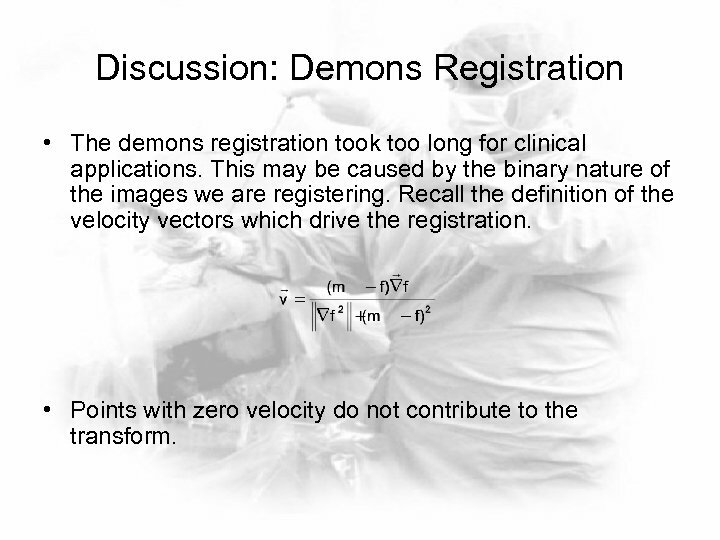 Discussion: Demons Registration • The demons registration took too long for clinical applications. 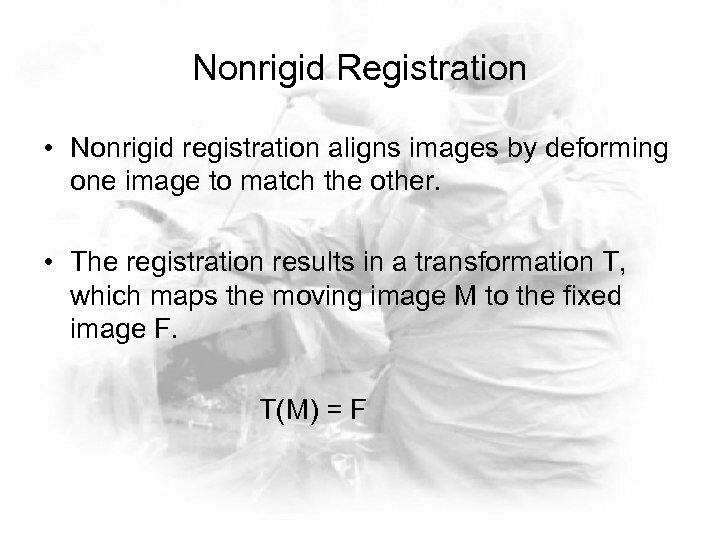 This may be caused by the binary nature of the images we are registering. 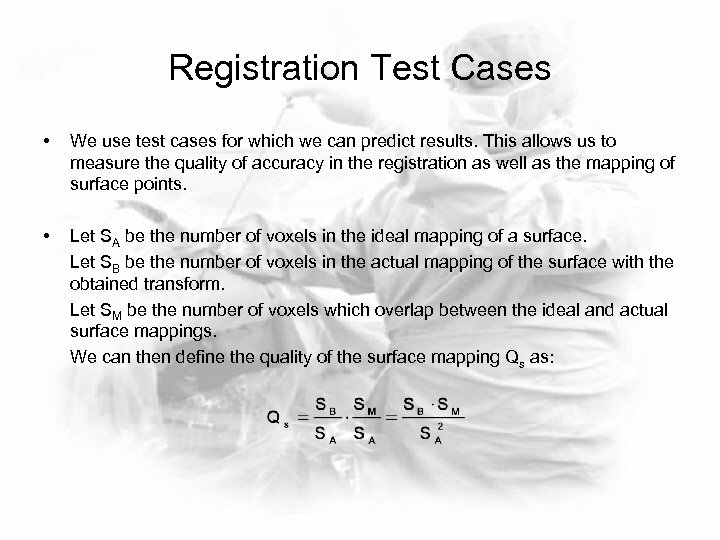 Recall the definition of the velocity vectors which drive the registration. • Points with zero velocity do not contribute to the transform. 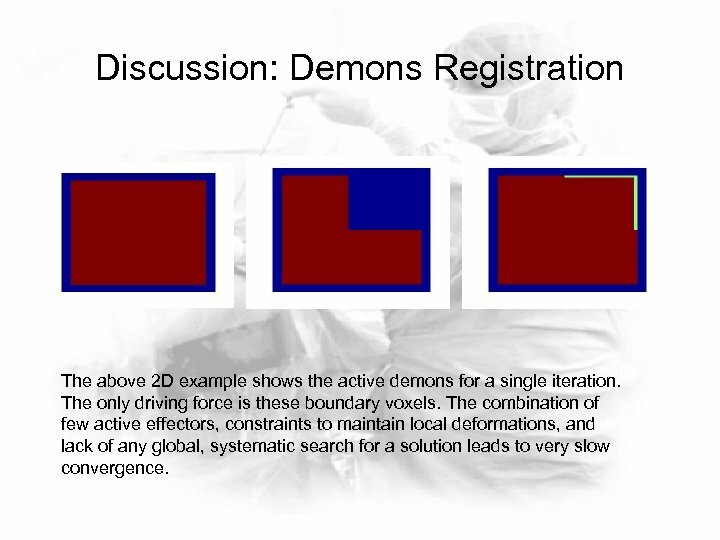 Discussion: Demons Registration The above 2 D example shows the active demons for a single iteration. The only driving force is these boundary voxels. The combination of few active effectors, constraints to maintain local deformations, and lack of any global, systematic search for a solution leads to very slow convergence. 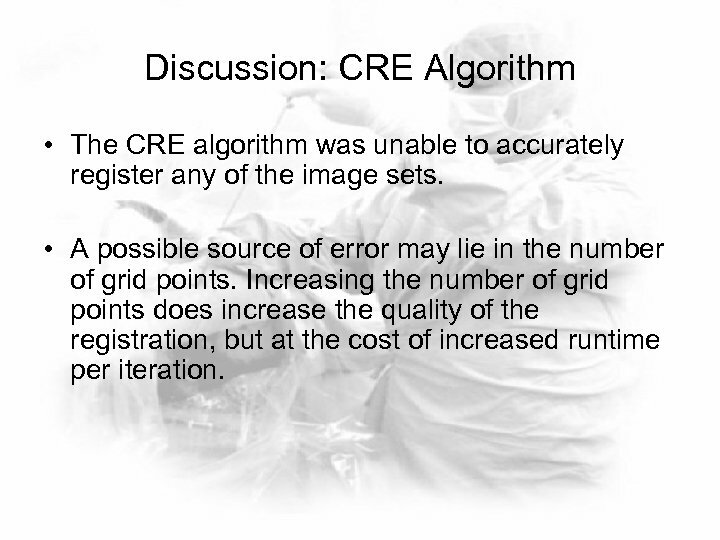 Discussion: CRE Algorithm • The CRE algorithm was unable to accurately register any of the image sets. • A possible source of error may lie in the number of grid points. 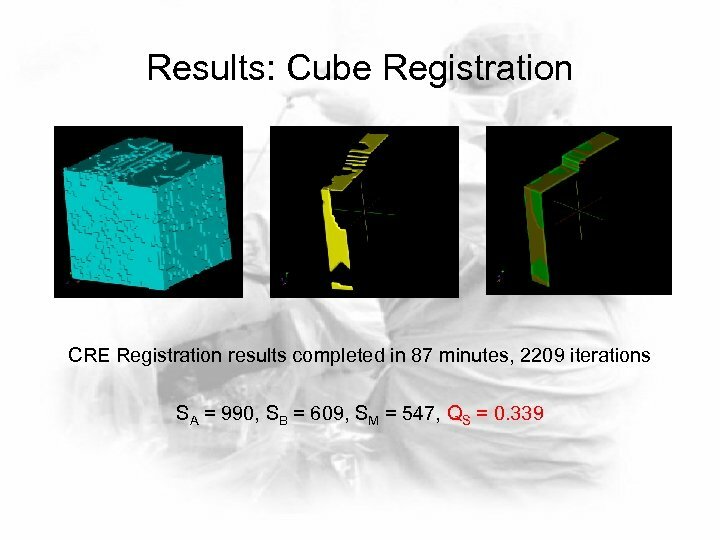 Increasing the number of grid points does increase the quality of the registration, but at the cost of increased runtime per iteration. 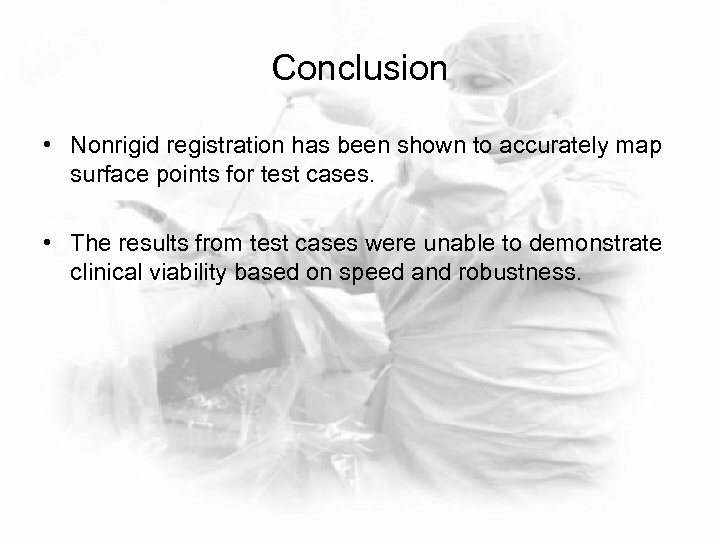 Conclusion • Nonrigid registration has been shown to accurately map surface points for test cases. 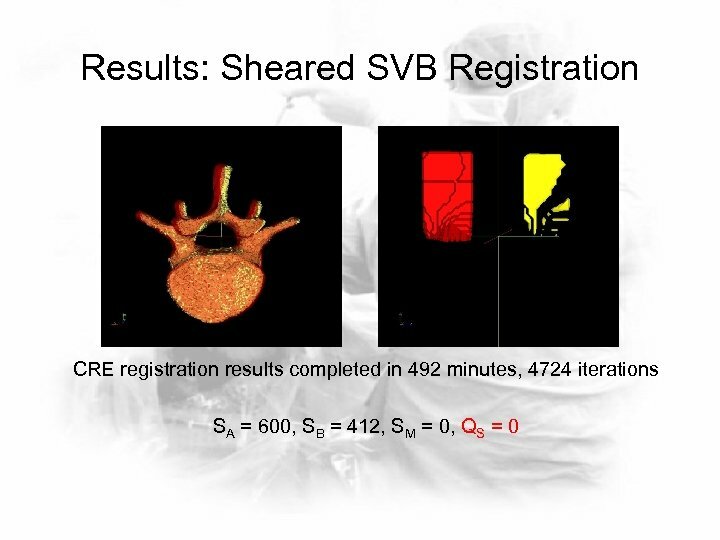 • The results from test cases were unable to demonstrate clinical viability based on speed and robustness. 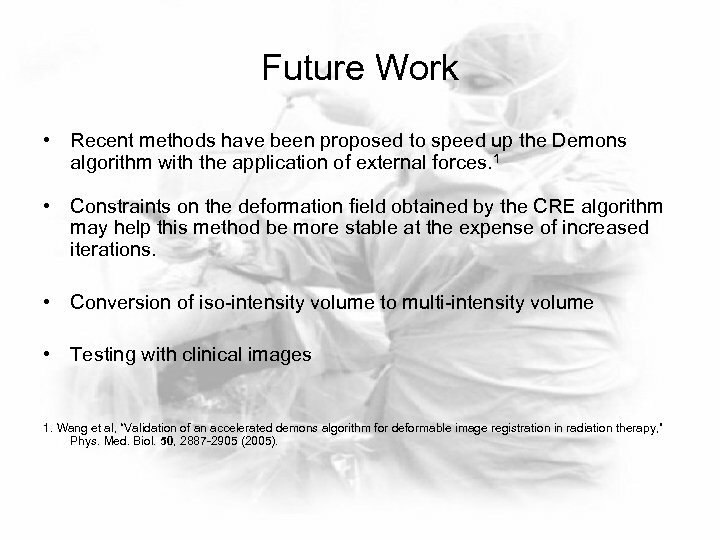 Future Work • Recent methods have been proposed to speed up the Demons algorithm with the application of external forces. 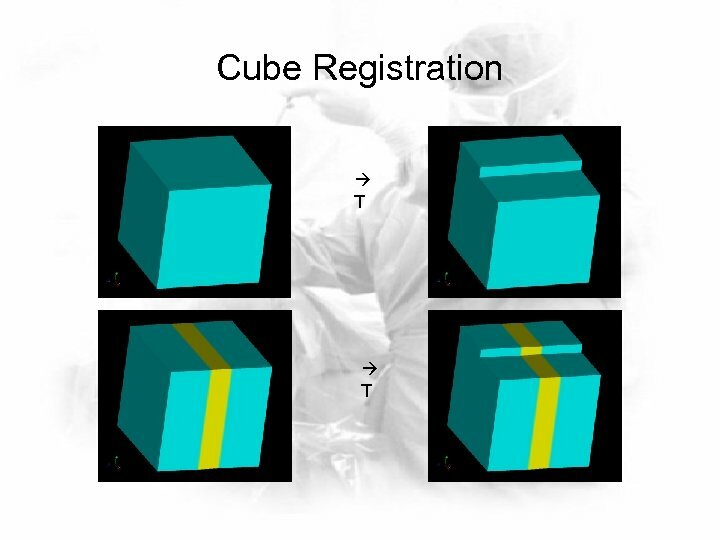 1 • Constraints on the deformation field obtained by the CRE algorithm may help this method be more stable at the expense of increased iterations. 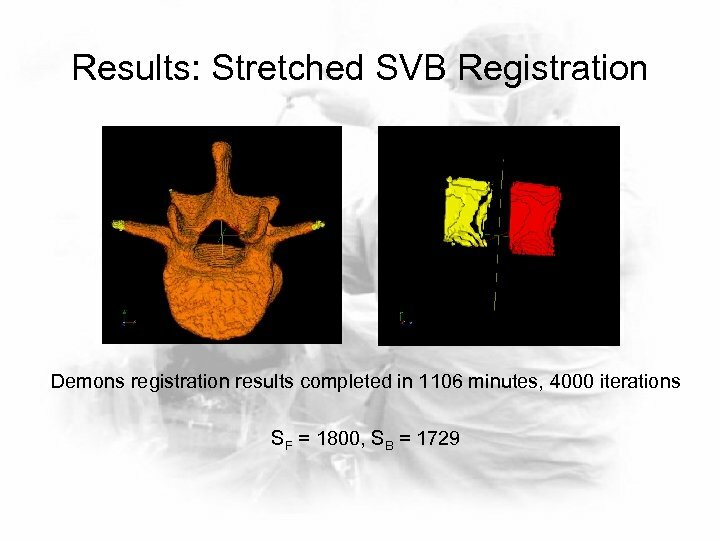 • Conversion of iso-intensity volume to multi-intensity volume • Testing with clinical images 1. 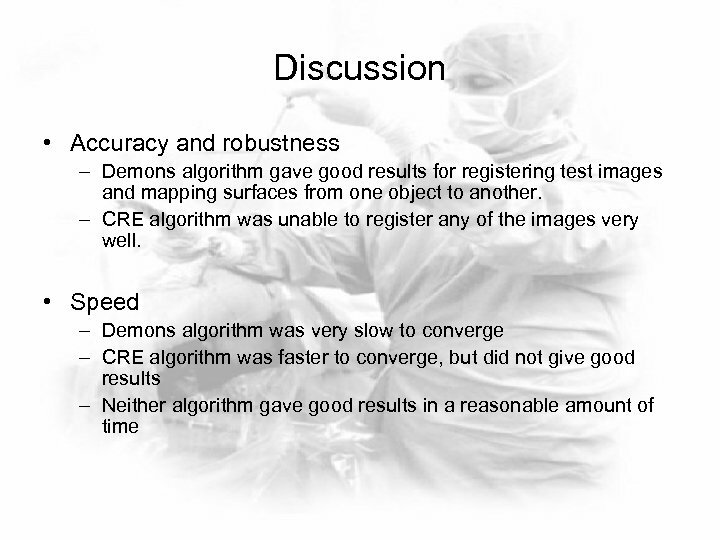 Wang et al, “Validation of an accelerated demons algorithm for deformable image registration in radiation therapy, ” Phys. Med. Biol. 50, 2887 -2905 (2005).